When most people think of vehicles being damaged by floodwater, they think of the cars and trucks that get flooded in Gulf States each year by hurricanes and tropical storms. Annually, tens of thousands to hundreds of thousands of vehicles are damaged by flooding and it is estimated that in the year 2001 alone, more than 600,000 vehicles were damaged by hurricanes and tropical storms. While most of these flooded vehicles end up having their titles marked as salvaged, many uninsured vehicles end up slipping through the cracks and are deceptively reconditioned to look as though they were never flooded. These vehicles can then be sold to unsuspecting buyers who might not know how to spot vehicle flood damage. In California, where flooding is a rarity, many car buyers will never even question whether the used vehicle they are considering to buy may have had flood damage. This creates a perfect opportunity for dishonest sellers to make large profits from the sale of flood damaged vehicles. While flooding may seem uncommon, it can happen anywhere and at any time. Storms in the desert can quickly turn to flash floods washing cars away, rivers can flood over their banks, a flooded street with deep water may deceivingly seem shallow enough to drive on, a pipe in an underground garage may burst or a vehicle may accidentally be backed underwater from a boat launch. The amount of flood damage to a vehicle varies depending on whether the flooding involved fresh water, salt water or muddy water as well as how much of the vehicle was submerged. Vehicle flood damage is affected by what kind of treatment was given to the vehicle and how much time passed between the vehicle’s submersion and the treatment. Vehicle Flood Damage may not always be visible. The computer systems and electrical components that are in vehicles are connected by a vast series of wires that run throughout the entire vehicle. After a vehicle has been submerged in water for any length of time, moisture gets trapped in the vehicle that, over time, will slowly rust the wiring causing various components to malfunction or fail as the electrical currents erroneously ground when they encounter rust. This failure could seriously rick the safety of anyone in the vehicle as it is unpredictable and could affect any system in the vehicle including but not limited to the fuel system, steering, brakes and airbags. This complex series of wires is very difficult and expensive to replace so often it will be left to possibly fail by simply covered the wires with new upholstery or carpet. In addition to the computer systems, electrical components and wiring, rubber seals and o-rings may swell and leak, sensors may fail and the transmission could start to deteriorate. 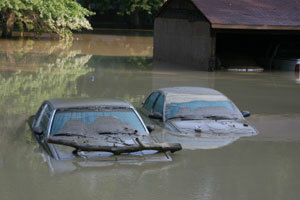 Flood damaged vehicles are ticking time bombs. Below are a few signs to look for when considering a used vehicle that may help protect you from purchasing a flood damaged car, truck or vehicle. Check If Vehicle Has A Salvage Title. A problem with one or even some of the items above may not mean that the vehicle has been submerged in water, but should make you aware and more cautious of the of the possibility. When in doubt, walk away. The cost and time spent dealing with corroding wires, failing systems, faulty computers and the increased chance of getting into a serious accident makes flood damaged cars, trucks, SUVs and other vehicles simply not worth the initial savings, let alone the risk! If you suspect that you may have bought a vehicle that was submerged in water and then sold to you without disclosure, then you give us a call at 213-282-2000 or fill out our FREE Vehicle Evaluation Form and one of our CA Dealer Fraud Attorneys will review your case to discuss what legal options are available to you.